The above shot shows one of West Hartlepool Corporation centre-entrance double deckers, this style of bodywork dated at West Hartlepool from the late thirties onwards although there were some post-war 8 foot wide examples. This style was also popular with Sunderland and a few other operators. My question is if anyone knows why on earth the operators wanted this design in the first place. I can just about remember them in service, and they were quaint if nothing else. By the time that I knew them they were used mainly on the lightly trafficked routes 2 and 3 to the Park area, and for duplicates and specials. On entering the wide centre door there were two separate compartments, front and back, and if I remember rightly these had their own sliding doors, rather like a railway compartment of the time. At least some of the seating was bench seating, which in the rear compartment would cover the wheel arch, and I suspect that each compartment held ten passengers. Opposite the door the staircase divided into two, fore and aft, hence the wide blank area seen in the offside view. Upstairs the seating was effectively divided into three parts, to the front, rear and some further seats between the stair heads (possibly 3 rows of seats at the front, two at the rear, and four double seats in between). Whilst the exact configuration is a mixture of guesswork and memory the stated capacity was H48C; the 8 foot wide models were H50C, and I think this was achieved by fitting a single centre seat facing backwards from the front bulkhead and the centre of the rear compartment. The fleet were withdrawn in the mid 50s, and the older models were scrapped (although I believe that at least one was preserved); the newer models were rebodied as H59R. As this layout would have been readily available when they were built I have always wondered why anyone would want a design which must have been more difficult to build, a conductor’s nightmare, and which involved the loss of capacity for about ten extra passengers! Just a memory from the mists of time, but I believe that the appeal of this design was speed of loading on busy routes. Its easy to see that this was a very valid consideration as the long awkward queues to access the traditional front or rear exits in both saloons were at least halved, if not eliminated altogether. The same or a similar principle applies today for operators who insist on avoiding centre exits on colossal modern vehicles holding approaching one hundred passengers. I have personal experience of the disastrous effect on timekeeping (and convenience) on busy services with today’s single doorway giants – even now I’m retired I sit in exasperation while watching the inevitable battle between those struggling to alight and the incoming hordes paying and looking for space. So, in summary, the old centre doorway and two staircases was a very good idea indeed. West Riding "Red" buses were something like this configuration, too. There was supposed to be a mysterious connection with the trams that they replaced. The double-deck RER trains in Paris have a similar system, but the door is between decks. Anything has to be better than the present OMO arrangements on awkwardly seated double deckers which tumble you to the front at stops! Joe I don’t think that its a mysterious link with the old trams – simply a rather lovely long lasting legend. Arriva service 110 from Leeds to Wakefield, Sandal, Kettlethorpe and Hall Green, formerly West Riding number 10, is still to this day referred by staff as "The track." I loved working on that route – to this very day you can still sense the honest hard working "no nonsense" atmosphere of long ago despite the somewhat different vehicular equipment – its impossible to imagine one of the centre entrance red Mark 3 Regents being called "Jonathan Ross" – oh dear, I must take a lie down and a glass of Sanatogen !! The main exponent of the centre entrance double decker was of course Blackpool with large fleets of both pre- and post-war Leyland Titans with this arrangement. These were the brainchild of General Manager Walter Luff who I believe specified the design to maintain a ‘family’ similarity with the ‘Baloon’ tramcars built in the 1930’s, many of which are still in existence although with much rebuilding. The post-war PD2’s were 8 feet wide with fully-fronted locally built Burlingham bodywork and only had a single staircase but otherwise followed a similar arrangement to the West Hartlepool vehicles with two distinct (forward and rear) lower saloons. The entrances were fitted with powered sliding doors and the vehicles were extremely well-appointed inside with lined-out ceilings and coach style moulded glass light fittings. They were the mainstay of the Blackpool fleet when as a child I was taken to Blackpool for family holidays. I thought they were magnificent. I was most disappointed when new buses arrived in 1959 with boring open rear platforms due to a change of policy after Mr Luff retired to be replaced by a new manager. It is ironic that after having buses with doors in the 40’s and 50’s, Blackpool stuck with open platform rear-entrance PD2’s and PD3’s when many Lancashire operators were adopting the forward entrance arrangement pioneered in the area by Ribble. The last buses with this arrangement to enter service in the UK to my knowledge were the SHMD Daimler CVG6’s and solitary Atkinson in the late fifties. I believe the GM at SHMD at the time had served at Blackpool under Walter Luff at some stage in his career. I had never seen anything like this until I was taken to Blackpool as a youngster, they of course had a whole fleet of Burlingham bodied centre entrance PD2’s. I can see the advantages of this layout, but they must have been a nightmare for the conductors at peak times, as no matter which way you went first, their would always be someone at the other side of the entrance who was only going a couple of stops and could avoid paying. Yorkshire Woollen purchased a number of Leylands to this configuration in the 1930s for tram replacement.They were nicknamed locally as :room and two kitchens. No less than seven of the magnificent Yorkshire Woollen TDs later served, on far gentler services, in Bridlington – not a Dewsbury style incline to be seen anywhere. Williamsons had HD 4629/4630/4801/4803/4810, all of which retained the beautiful YWD elaborate fleet numbers inside. HD 4625/4631 with White Bus ventured "long distance" as far as Sewerby and Flamborough. White Bus travelled a fair old ‘long distance’, Chris Y, which I’d have thought would have taken a couple of hours at least. Were these vehicles stored for a time before bodying? I’m not disputing the date which is borne out by the West Hartlepool fleet list but 1947 seems rather late for a CWD6. The CV had become well established by then. Grimsby Corporation also favoured centre entrance vehicles (AEC Regents, and some trolleybuses) in the 1930s – all, I think, with Roe bodies. I can just remember travelling on one of the Regents from Riby Square to Old Clee the first time I visited relatives in the area. This would be December 1956. I don’t think any of them survived to be absorbed into the Grimsby-Cleethorpes joint committee, formed the following year. I seem to remember that the centre staircase design was subject to legal action with English Electric (Preston) resolved with a licensing agreement between the two companies. I know what you mean Chris H about the "long distance" but the dear old TD1s would have surprised us !! I daresay that years of conquering the mountainous Dewsbury district terrain stood them in good stead for their genteel retirement on the East coast – and possibly the bracing North Sea air was like nectar to carburettors accustomed to industrial smog. In the event they managed the journey time to North Landing (25 minutes out, 23 return) and Lighthouse (28 minutes each way) with scarcely a minute lost or an asthmatic gasp !! Mr Whitely, the Grimsby gm. worked very closely with Roe on the centre entrance idea, designed to speed loading. This was in 1930, and Roe had some success in marketing the concept, BCN becoming early users too.Just who owned the patent though, as David points out, is questionable, as EEC produced a batch of centre entrance Regents for Nottingham in 1929, and Roe "fell out" with Brush in 1931 after the latter also built some vehicles, some on Crossley chassis, for BCN during that year. Regarding the Blackpool connection, I think Walter Luff brought his C/E ideas with him from West Riding, when he became BCT gm. in 1933. Regarding the Y.W.D centre entrance double deckers. The majority were bodied by Roe but in 1933 269-277 were bodied by Weymann. According to the publication of the history of Weymann they had to pay Roe royalties as Roe held the patent for this style of body. Aw, shucks, Chris Y, you’re so good at all that poetic stuff! But well put and I’m picturing the ride now, although I’d rather live it! I take it the shorter time back from North Landing was because of the bracing easterly breeze off the North Sea! Were the entrances open to elements, or did they have doors? Pictures of the Grimsby ones seem to show outward-hinged swing doors at the top of the steps, but on every picture they are open. The rear compartment must have scooped up those icy blasts off the North Sea, in either Grimsby or West Hartlepool, at this time of the year. Definitely the seats of last resort for the cognoscenti! I’ve enjoyed reading everyone’s comments on the practical pros and cons of the centre-entrance twin-staircase layout, but most of all I love the sheer character of this wonderful W Hartlepool bus. Livery, unfailingly handsome Roe bodywork, the sit-up-and-beg look, two-letter registration—it’s got everything! I rode as an 8-yr-old on a Venture of Basingstoke (ex-Burnley 76) which must have got the fascination going. At least one centre-entrance Grimsby decker(1931 body on 1935 chassis) mentioned by Stephen Ford was still in the depot at Easter 1957. I had a peep at the W Hartlepool fleet list and notice that very early withdrawal (11-12 years) was the policy for a good while. Little chance, then, that EF could ever have been preserved! Thanks Chris H – I do think that a bit of different terminology adds to already fascinating topics sometimes. I found the different running times to be puzzling – its a long time ago – but on reflection I think that the outward journey to North Landing was via Prospect Street, the cenotaph, and various minor thoroughfares before joining the main Flamborough Road somewhere near Fortyfoot. The return was via the main road and the Promenade to Queen Street and therefore probably easier and slightly quicker. This doesn’t explain though why Lighthouse was the same both ways ?? Either Chris or Peter have got a bit lost! Those buses are now working a service from Bridlington to West Hartlepool, as if Dewsbury wasn’t bad enough! Thanks Ian. I found a comment on Flickr to the effect that a number of the Grimsby Regents survived to 1958, but none were every repainted blue and cream. Three of the Regents (fleet numbers 60-62) received conventional East Lancashire replacement bodies during the war, after bomb damage to Victoria Street depot destroyed their centre entrance superstructures. Thanks, Chris H, for welcome news of EF 3780’s survival. Where does it live? Regarding the patents for centre entrance double deck bodies in the 1929/31 period, the published material states that the patent was held jointly between EEC and Roe, and that royalties were payable by other builders. EEC produced a batch in 1929 for Nottingham BEFORE the Grimsby prototype, so presumably the 2 concerns were working in unison. It would be of interest to find out if there were any design differences between the two at this early stage, with regard to stair layout etc. The Blackpool connection is interesting, as Walter Luff had experience of the Roe variety at West Riding, and early Blackpool TD3s were built by EEC and Roe. 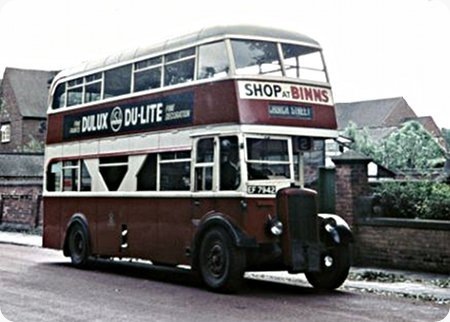 I remember reading somewhere that the Burlingham TD3s had several EEC features included in their design, as well as the centre entrance, and this practice could well have been a follow on from the Blackpool rear entrance TD2s, which are given as bodied by Burlingham, but look (to me anyway), just like standard EEC composite bodies of the period. In my gallery there is a series of photos of an English Electric-bodied Leyland Titanic for Bury which had a centre entrance. These show all angles so will be good for comparison with other designs. http://davidbeilby.zenfolio.com takes you to the first image. I have checked the "full on" staircase view of the Bury "Titanic" with a similar angle photograph of the YWD TD2s, and I cannot highlight a difference in stair layout. Can I say how much pleasure I have had looking at your gallery of pre war EEC bodies etc. Any chance of any more Bradford pre-wars ? John – you’ll be pleased to know I have a big Bradford project going on at the moment which I’m sure you’ll find of interest! It will be live in about a month – in the meantime I’ve got a lot of work to do! The centre-entrance topic died long before this 2013 posting but I can add that I travelled on the six S.H.M.D. Daimlers and the single Atkinson 40-odd years ago and they were warmer in winter than their back-loader successors (the doors never seemed to be a handicap to the crews, either). Both West Hartlepool and Sunderland seem to have given a higher priority to the ever-present "Shop at Binns" ad than to giving would-be passengers a comprehensive, decent-sized, route-indicator display did Binns have some kind of hold on North-East bus-operators to be able to get such prominent placing for their name? With regard to your last sentence John, the answer to the "some kind of hold" is I’m sure a simple one – "Revenue" !! Interesting also is the full size advertisement on the CWD6 – DULUX, the four small words being "Fine paints, Fine decoration." This was an extremely smart advertisement with dark blue base and cream/white lettering, and it was used virtually nationwide on many operators’ buses, including good old Samuel Ledgard’s vehicles. I’m afraid I can’t agree with your remarks about the ‘Shop at Binns’ advert. It’s a point which could reasonably be made about some SDO ‘deckers of that era which had very narrow destination apertures and no route number but they were, after the mid-’50s, the exception rather than the rule. West Hartlepool destinations were of perfectly adequate size – larger than many, in fact – and the route number box is to be found under the canopy (on this one, showing ‘2’). Sunderland Corporation didn’t introduce route numbers until 3 July 1953. This was one of many innovations proposed and implemented by Norman Morton during his tenure as General Manager. Mr Morton had been appointed twelve months earlier and older buses were either rebuilt to carry a route number box alongside the destination display or fitted with number boxes under the canopy similar to that on WHCT 14 above. Mr Morton also recommended that the red livery, which was very similar to that used by Northern General, be replaced by green and cream and that the ‘Shop at Binns’ advert be standardised on a style also not dissimilar to that on 14 above. It has to be said that some the earlier ‘Shop at Binns’ adverts on Sunderland buses and trams did dominate the destination display which, on buses, consisted of two boxes, either alongside one another or above one another depending on the vehicle, one showing the destination and the other showing ‘SCT’.